A brave work of art, V V Brown is holding the reins this time around. This is the sound of an artist breaking away from the shackles of the corporate music world's cookie-cutter, pop star mold. 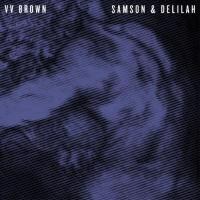 A provocative, menacing beast has arrived with the release of V V Brown's polarizing sophomore album Samson & Delilah. Rarely does an artist reinvent themselves in so drastic a manner, that their previous incarnation sounds like that of a completely different musician. The retro-leaning, R&B, soul and rock & roll texture of her debut album Traveling Like The Light has been replaced with avant-garde synth pop, epic in scope and icy cold in delivery. Some may balk at the theatrical grandeur of this stunt, but it's so skillfully produced, arranged and constructed that I couldn't help but succumb to the dark beauty of it all. The Biblical concept album Samson & Delilah feels like it was purposely crafted to erase all memory of her debut album, and in that, it wholeheartedly succeeds in forging a completely different identity for Brown. She's now more like Grace Jones and the glacial histrionics of early Eurythmics, blended with the aggressiveness of the Knife or Fever Ray, than anything resembling a British version of Janelle Monae. The latter comparison that hounded her debut, can finally be put to rest with this album. One listen and it's apparent that this is the sound of an artist breaking away from the shackles of the corporate music world's cookie-cutter, pop star mold. Brown is holding the reins this time around and doing things entirely on her own terms. Her original sophomore effort Lollipops and Politics was scrapped right before its release date in 2012, and produced a rather irksome single, "Children" with Philly's Chiddy of former pop-rap group Chiddy Bang. At the time, I was anything but impressed and I dreaded an entire record of similar songs, but it appears the ten track album wasn't up to par with her standards anyway. It disappeared and so did V V once again, into the studio to collaborate with previous engineer Laurence Aldridge, Pierre-Marie Maulini of M83, Pascal Gabriel of Bomb the Bass and Dave Okumu, whose wizardly studio talents elevated the stellar songs of Jessie Ware's debut Devotion to loftier heights. The resulting effort is a wonder to behold. First track "Substitute For Love" announces both a stylistic change in what we've come to expect of V V Brown's music and a completely different vocal presentation. When the official video for "Samson" arrived, I thought my ears were playing tricks on me, as I watched the Biblical, black and white kabuki theatrics on the screen. Reminiscent of the time when Imogen Heap left the husky timbre of IMegaphone behind and reappeared singing an octave higher than before, with her band Frou Frou, Brown has returned to defy all expectation. No longer bright, forward and ringing, the darker, richer contralto offered up is borderline operatic and honestly a thousands times more interesting than its predecessor. The first two songs "Substitute For Love" and "Nothing Really Matters" immediately call to mind the similarly titled tracks from Madonna's game-changing album Ray of Light. While I acknowledge that this could be merely coincidental, it's worth noting nonetheless, and I can imagine multiple reviews of Samson & Delilah will pick up on this. Brown has completely revamped her image, her sonic approach and her voice, so it's possible that Madge's experimental record had some influence. She sings, "I'll be your drug, I'll be your heroin / Put me inside your veins and let me in" as majestically-paced, Active Child-like atmospherics cloak the song in melancholy desperation. This is a far cry from the sassy, empowered brassiness of "Game Over" or anything off her sugar-laced, poppy debut album. "Nothing Really Matters" continues the self-deprecation, blame and introspective lyricism, but with constantly swirling, arpeggiated synths that thrusts the drama forward. A definite highlight of the record, the repetitive chorus firmly embeds itself in the mind. Eerily-threatening third track "Samson", recounts the moment when Delilah cut off the hair of her lover and diluted his strength. It seemed a rather odd choice for a first single, with it's cantankerous, thundering percussion, but it fits perfectly in the context of the rest of the record. Challenging her creativity even further, she successfully attempts to broaden her palate even more by rapping on the claustrophobic, dupstep-laden "Igneous", while later presenting a gorgeous, emotional snapshot of a dissolving relationship in "Knife". The album is split between brooding, drama-laced ballads and a few throbbing, cuts like "I Can Give You More". With it's overly-processed, stuttering vocals, the track continues the tribal aesthetic presented by "Samson", but amps up the bass. Therein, lies the only problem I can see with the record. On a few tracks, the production muddles the vocals to the point where the text Brown is trying to convey, becomes completely obfuscated. That might have been her point. It's possible she was going for mood over lyrical clarity, and this pops up multiple times during the record, in the aforementioned "Samson" and the hazy, glacially-paced, but poignant closer "Beginning". Tis a minor quibble though. Enthralling, second single "The Apple", "Faith" and "Ghosts" are presented as sort of uptempo trilogy in the second half of the record. "The Apple" is the most accessible of all the songs on Samson & Delilah, has a distinctly retro '80s flair, and is remix ripe for the picking. Optimistic track "Faith" is a collaboration between producer Laurence Aldridge and Brown, yet while the male vocals of the duet go unlisted, one is to assume they belong to Aldridge himself. It's one of the few points in the album when the sunlight pours through. Brown has said "Ghosts" was inspired by the Drive soundtrack and it instantly calls to mind the former brilliance of Annie Lennox's overflowing creativity three decades ago. Singer-songwriter, model, producer, record label CEO (YOY Records), and fashion designer Vanessa Brown wears many a creative hat. Confounding expectations seems to be her modus operandi and I wouldn't be surprised if her third record sounds nothing like either of her previous releases. Whether this foray into a darker territory will prove fruitful or not, remains to be seen, as there are no radio-friendly singles like "Shark in the Water" to be found. Her fans have eagerly awaited a followup to her 2009 debut and now that it has arrived, it'll be interesting to see how this will be received by the public at large. Regardless of its commercial success, count me as one of the dazzled disciples. Samson & Delilah is a brave work of art.